The president of Université Laval has actually started his own campaign against the PQ’s cuts. 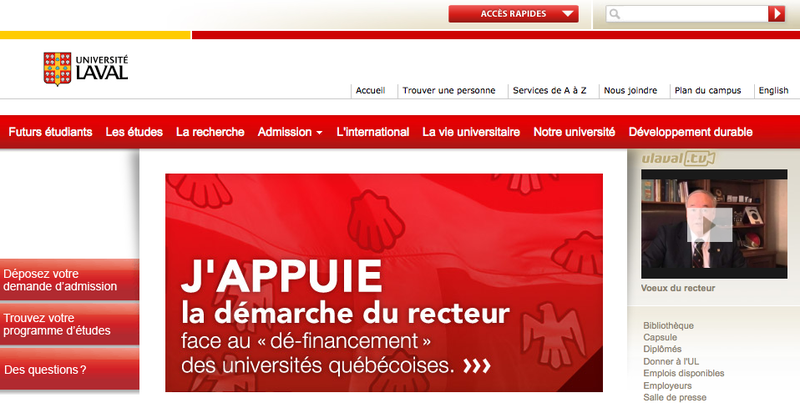 It says: I SUPPORT the position taken by the president in the face of under-funding of Québec universities. For a post-secondary education junkie like me, my move to Québec couldn’t have been better timed. I left Ontario in June, amid inane ramblings emanating from the cerebral cortex of Glen Murray. His planned changes to Ontario’s higher education sector were outlined in the leaked document, 3 Cubed, that had been widely panned in the winter of 2012. Not one to give up after a failure, Murray repackaged his scheme and tried to shop it around again in the summer. This rollercoaster ride was giving me ulcers. Imagining Murray actually implementing his changes and further destroying Ontario’s higher education system made me want to throw my computer out of the window of my ninth floor office building and accidentally use such force that it would land on top of a bunch of dinosaur bones at the ROM, across the street. (With a good wind, maybe possible). Luckily, Murray’s ambitions were stronger than the belief in his convictions (like all great politicians) and he jumped ship as Minister to (hilariously) run for the leader of the Liberal party. Since October, with the elementary and secondary teachers in the crosshairs of Dalton McGuinty, all has been quiet on the post-secondary education front in Ontario. But not so for here. 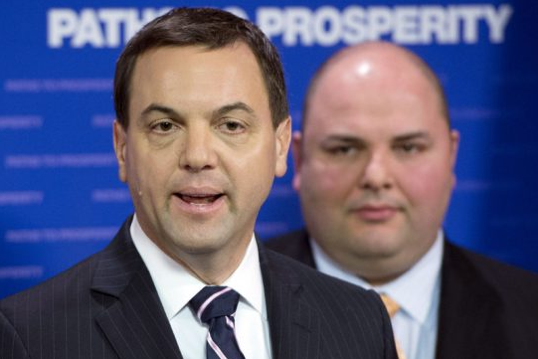 Québec politics has picked up the slack where Ontario left off. After last year’s mega doses of awesome, the combination of an election and the acceleration of semesters to catch students up who were on strike had the double effect of slowing down the student movement. 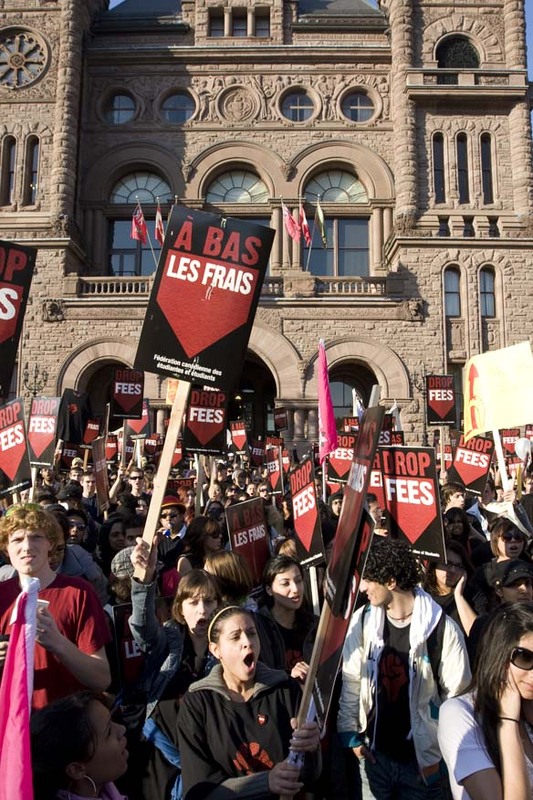 Marois repealed Law 12 (Law 78) and replaced the tuition fee hike with an increase tied to inflation. For the students, both policies represented tangible and immediate victories of the work from the previous months. The PQ is a party that is both populist and neoliberal. It bowed to the students demands not because its a party that fundamentally believes that higher education should not be bought and sold, but because the student movement made it possible for them to get elected. It was therefore impossible to immediately ignore their demands. Once the new government settled down, though, the PQ implemented five per cent cuts, across the board, to university budgets. With the victory of the student movement fresh in everyone’s minds, the argument flowed that the cuts were necessary to make up for lost revenue in with the tuition fee increase. While not true, the argument can be made to seem logical, and therefore, convincing. And, with university presidents and many faculty having opposed the student strike, this policy preys on divisions that already exist within the sector and weaken the bargaining position of the sector as a whole. Higher education in all provinces is underfunded and Québec is no exception. Though nowhere near as underfunded as many university presidents claim, the intentional further underfunding by the PQ is a regressive move. Here lies the break from populism to neoliberalism: get elected, implement regressive cuts. They didn’t stop there, though. They also cut the lifeblood of university research, FQRNT, by a whopping 30 per cent, after the applications for 2013 had already been submitted. This will fundamentally and abruptly alter research this year: professors will be expected to do just as much with less, fewer graduate students will be hired and competition will become more fierce among a group of people already competing for scare resources. This, all while they host a summit on education to consult on the future of higher education in Québec. Similar to the Dog-and-Pony-Show of Bob Rae in Ontario in 2005, the PQ has let it be known that they prefer the current policy of tuition fees tied to inflation before the summit has finished its work. So on the higher education continuum, so far, we have the Liberals trying to emulate the worst of Ontario’s policies and gut the best of Québec’s, which delivered them a shitkicking at the polls. Slightly to the left of them is the PQ who has basically tricked the electorate into believing they’re the “progressive” choice of the lot. With Québec solidaire the only party with the clearest and most progressive policy out there (free education at all stages of life), they occupy the left. This leaves the CAQ who, of course, devises a plan that is even more schemey than had been proposed by the Liberals. They argue at the summit that Québec should create two tiers of universities: one elite and one common. The elite schools will be able to set their tuition fees at any rate and grants and loans will fill in the gaps to ensure that McGill doesn’t become overrun with rich Americans and Ontarians. Of course, the only way that the state could actually do this is to significantly reduce the public funding offered to these schools. In Ontario, this idea floats around the tables of the Council of Ontario Universities too. Led by U of T president David Naylor, he argues for the creation of a funding model that would all U of T (and a few other schools) to deregulate their tuition fees, charge what the market can bear and become truly prestigious. Unsurprisingly, the presidents of the the Brocks and Nipissings of the world tend to oppose these recommendations. Either way, I suspect that the CAQ’s dream of an elite Université Laval is about as likely as their likelihood of forming a majority government. This is good news, but it doesn’t mean that the CAQ should be ignored. In a minority government situation, there is a high possibility for the proposal of strange, regressive policies to be developed, voted on and passed. This is why the students’ and faculty responses will be so important. Have you read this yet? It’s the subject of this post. I think it’s necessary for the student movement in the ROC (rest of Canada for you ROC’ers) to examine the difference in student organizing outside Québec. I’m glad Brian Platt took a shot at it (actually, a good shot at it), although I think he missed some important aspects of the student movement outside of Québec. I spent the last year of my job with the Canadian Federation of Students asking this question: what makes Québec’s model of organizing so effective? How have they succeeded in mass mobilization? While I think Platt makes some reasonable arguments, his main thesis, “anglophone student unions aren’t built for protesting” is untrue. 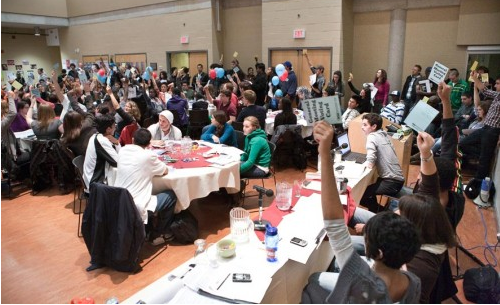 Differences do exist between Québec students’ unions and the ROC but it’s not this simple. Sandy Hudson and I came up with four reasons for why the Québec student movement has been so successful and what Ontario can learn from it, but that’s a topic for another bottle of wine. On Platt’s piece. First off, there’s a huge difference between students’ unions that are structurally apolitical and politically apolitical (or politically oriented such that they support the government of the day). There are many students’ unions in Canada that are political apolitical, but not that many that are structurally apolitical. Universities like Queen’s, Western, McMaster and others in Ontario, for example, have vast resources, but fail to venture past a Liberal politic in their campaigns. This isn’t to say they couldn’t become politicized. Most college students’ unions in Ontario have also been depoliticized, but it has been more through the co-optation of student leaders, not necessarily thanks to the structures of their students’ unions. From what I’ve seen, the students’ unions in Ontario that get away with being the least political (or most Conservative/Liberal) are the ones where their executive members are not elected at large. Or, where their representatives are selected structurally by the fewest people. In most cases, the president is elected at large, then he/she either appoints their vice-presidents or they are selected by board members who received fewer votes relative to what someone running for a VP position would receive. This is highly undemocratic and is a structure that keeps a dissenting politic out of the students’ union. The examples of this that I am aware of are at a few Ontario university students’ unions that are members of the Ontario Undergraduate Student Alliance, with two or three exceptions, and part-time students’ unions with a delegated class representative structure. Some college students’ unions are also organized this way. Platt argues that the time spent on services is what really stops ROC students’ unions from mobilizing the way Québec students have. This is only the case where there aren’t enough activists involved in a students’ union. Of course, if your one activist is busy signing health opt out cheques and not mobilizing for a General Assembly, it’s a struggle between the two. But services are inherently political. The service centres that are strong in many Ontario students’ unions are what drive students to their students’ unions. Racialized student collectives, women’s centres, disability centres and others help to outreach to students and enable them to access the mainstream student political sphere. Where these services don’t exist, the student union is obviously and persistently less diverse. This is the case in many students’ unions in Québec and the movement is noticeably less diverse than it should be. University and college services are political and should be organized and coordinated by students. The existence of profiteering health and dental brokers (one of which I’ve had the peripheral pleasure of being sued by, being locked into a contract by, settling with and then being locked in a contract again…some of the signatories to that agreement did get jobs, so at least they sold out for something, I guess), is one of the obvious examples of why students should control their services. A glance at Ontario’s UHIP system can show anyone how damaging for students’ interests and their pockets it can be when administrators control student services. And yes, coordinating these services takes a lot of time. This is why it is critical for active, service-heavy students’ unions to ensure that they are placing as much importance and as many resources into the campaigns work that they have. I think it is also critical for ROC students’ unions to examine how students have organized in Québec and adopt the tactics needed to bolster similar efforts outside of Québec. Provincial solidarity is a major part and will make organizing in provinces like Manitoba or Newfoundland and Labrador easier (they also happen to be the other two provinces with the lowest tuition fees in Canada). 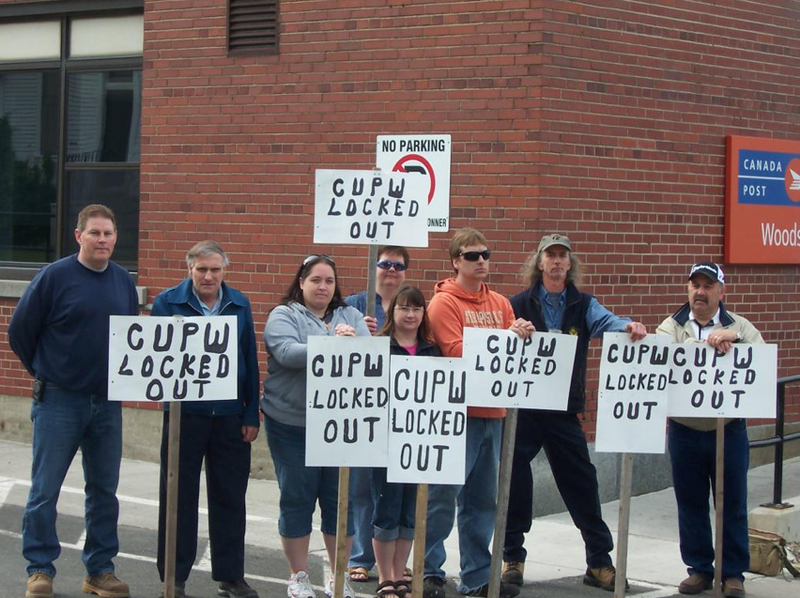 In a province like Ontario, provincial solidarity is not remotely possible in the current state of affairs. This is a threat to the capacity of the Ontario student movement. But the general assembly model is an important one that students’ unions should work to adopt. Organizing at the grassroots means going into each classroom, asking for them to select a representative and having open GAs at the departmental level where attendance is mandatory for class representatives, and encouraged for everyone else. Starting at this point would not only be constitutionally possible for local students’ unions, but would reach students in the classroom while they’re on campus. Minimizing students’ efforts to get them involved is critical, especially when tuition fees mean that you also have to work two jobs to stay afloat. Professors also become critical at this level, as access to their classes requires a level of support for the movement. The most important critique of Platt’s piece, though, is that the ROC is not a homogenous mass. The differences that exist among the students’ unions in Halifax alone cannot be ignored. Writing solely about one’s experience with the AMS at UBC (arguably one of Canada’s most bureaucratic and least political forces out there) and CUSA at Carleton (a service-heavy students’ union where campaigns this year have been eliminated by the current regime) doesn’t effectively capture the reality of the Canadian scene. I was elected to the Ryerson Students’ Union where I think we did the best we could to balance our services (two businesses, taking back control of our student centre, the pub and the cafe, grade appeals help, health plan and five equity service groups, events etc. ), but I know we could have done more. And, these things are always evolving. The current executive is probably doing more than we were able to achieve. While there are students’ unions I would consider to be comparable to RSU in size, scope and campaigns work, I’m under no illusion that RSU represented anything more than itself. That’s the danger of these generalizations. Both applied to the ROC and to the Québec student movement, they are somewhat helpful, but not really. Although, at the very least, I’ve just leaked 1156 words on this. Brian Platt gets all the credit for that.